Alas, as much as we would all like, its impossible to jet off to each and every film festival we hear of to immerse ourselves in languages of new cinema. Cannes, for many of us, is little more than a pipe dream and, unfortunately, the local multiplex's mainstream curation represents much of our exposure to new movies. Pleasingly, then, it is fantastic to note that Curzon Home Cinema - an art-house video on demand service - have teamed up with My French Film Festival to bring a selection of new Francophone film-makers straight to our screens. The 2016 collection constitutes a series of films and shorts created by a new generation of directors whose movies will be available online for the entire duration of the festival (now in its 6th year) - spanning from January 18th through to February 18th. To kick off the month, I dipped my toe into the festival water with a short film - costing only £1.50 to view - called M Seeking W (H Recherche F). 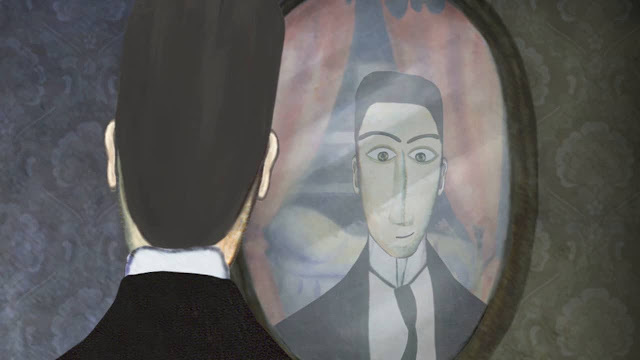 The 12 minute-long, dialogue-free animation, directed by Russian director Marina Moshkova, is the tale of an artist without a muse - his attempts at drawing self-portraits, holding an array of objects, are continually met with displeasure and dissatisfaction. As he imagines a woman in his paintings, our hero believes he has found the key to success - although accurately rendering a face to match his vision proves impossible without a model to paint from. How, he wonders, will he find real life inspiration? A Eureka moment hits our protagonist full-on as he browses Le Journal newspaper during a break from his failed creations. An advert for a dating service, an opportunity for him to meet a lady who could snap him our of his creative funk, provides a chance for the artist to finally fulfill his genius potential. Has his loneliness been holding him back all along? The lovingly drawn and whimsically scored animation is a sweet and charming movie which offers mirth in spades. We delight as we watch the would-be artist's journey impeded by Escher-esque traps, we laugh as he is faced with paintings he simply doesn't understand. As he confronts a Frida Kahlo-inspired creation, perhaps art, and women, aren't exactly what he thought they would, or should, be like? As an introductory tool to find new directors from across the Channel, My French Film Festival is incredibly useful. With full-length feature films available for as low as £2.50 (or £2.13 for Curzon members), each title is worth taking a gamble on; this is an innovative idea which I hope takes off for other countries too. A must for cinephiles, Francophiles and the genuinely curious everywhere.